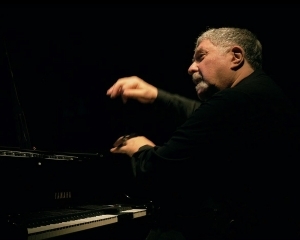 NYC Pianist Hal Galper and his trio featuring Jeff Johnson on bass and John Bishop on drums perform for a second night tonight at Tula’s Jazz Club and continue up and down the west coast on tour next week. The Honey Ear Trio – featuring the fabulous drummer Allison Miller, known for her work with organ meister Dr. Lonnie Smith; Seattle-bred bassist Rene Hart, left; and New York saxophonist Erik Lawrence – plays at 7 p.m. Wednesday at the Royal Room, 5000 Rainier Ave. S., Seattle; $12 (206-906-9920 or strangertickets.com). Tickets to the Bellevue Jazz Festival go on sale to the general public tomorrow, but as a reader of Seattle Jazz Scene you can buy tickets at 30% off until midnight tonight! Go to the Bellevue Jazz Festival Brown Paper Tickets page, select an event and use promo code PRESALE. Headliners this year include the Clayton Brothers Quintet, Booker T. Jones, and the Hubert Laws Quintet. For complete information, visit http://bellevuejazz.com. 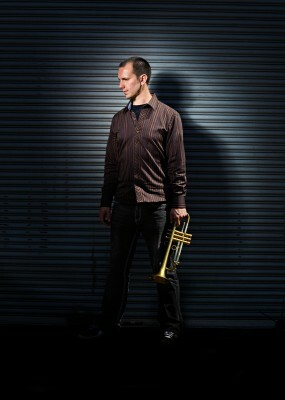 Note: Trumpeter Chad McCullough starts a weekend tour with his Spin Quartet featuring Geof Bradfield (sax), Clark Sommers (bass) and Kobie Watkins (drums). Someone once told me I couldn’t do it, and it was a waste of time to try because it wouldn’t work out. When I was 14 I heard Thomas Marriott play for the first time, and I figured out what I wanted to do. If I could do it all over again, I’d jump to less conclusions, buy fewer mouthpieces, and listen to my teachers more. When I look at where I’m at right now, I’m very thankful to everyone who has taken the time to help me, and grateful for everyone who’s given me a chance to do well- and even more grateful for the second chances. Fear is what wakes me up every morning. Usually much earlier than I’d like. Motivation is what gets me out of bed, after the panic attack wakes me up. Discipline is second only to respect. Or maybe it’s a byproduct of respect. I’m not sure yet. I’m not even close. But… I’m trying. If I had a double-C, I’d bottle that up, and sell it to all of my trumpet player friends for cheap! When I’m stuck It’s because I’m not listening hard enough. If I could have made a career on another instrument, it would have been the piano. I still pretend sometimes. Some musicians just don’t understand that we’re all in this together. I’m happy whenever I’m listening to Miles. The Seattle jazz community is [gathered] Wednesday at the New Orleans Restaurant to celebrate one of its own — bassist Chuck Metcalf. A onetime sideman for vocalist Anita O’Day and saxophonist Dexter Gordon — and a fine composer — Mr. Metcalf was one of Seattle’s top jazz musicians. He died in January of neuroendocrine cancer. He was 81. Born in 1931 in Grand Rapids, Mich., Mr. Metcalf moved to the Northwest in 1946, graduating from Highline High School and studying architecture at the University of Washington. Music, however, was always in his blood. As a student, he jammed at the Annex, a temporary building where musicians gathered, and his house on Brooklyn Avenue Northeast became a legendary jazz hot spot. Mr. Metcalf played on Seattle’s lively Jackson Street scene, snagging a plum job at the Black Elks club in 1951. While still in school, he married fellow student Joni Swartz, who later enjoyed a career as the popular Seattle vocalist and pianist Joni Metcalf. Mr. Metcalf had a thriving architecture business — The Seattle Times recognized him in July 1960 for designing the Home of the Month — and he never intended to become a professional musician. In the 1960s, the Metcalfs moved to a 12-room house in Madrona that also became a Seattle jazz haunt. Mr. Metcalf also helped found the Seattle Jazz Society in 1966. Mr. Metcalf left Seattle for San Francisco in 1972, was based in New York and Holland for a time, then came back to Seattle in 1985. In the mid-’90s, he moved back to San Francisco, where he retired in 2011. Mr. Metcalf worked with an impressive array of musicians, including Mark Murphy (with whom he recorded), Joe Venuti, Frank Morgan, Ernestine Anderson, Mose Allison, Benny Goodman and George Shearing. He was elected to the Earshot Jazz Hall of Fame in 1991. Chuck and Joni Metcalf divorced in 1960, remarried in 1962, then divorced again. Mr. Metcalf is survived by three children — Sarah, 58, of Idaho; Stephen, 56, of Seattle; and Matthew, 53, of Olympia — and three grandchildren. Rising-star bassist Ben Williams performs with his group at the Seattle Art Museum, downtown. The Washington DC-born, Harlem-based bandleader, musical educator, composer, electric and acoustic bassist was the winner of the 2009 Thelonious Monk Institute International Jazz Competition, an award that helped the young artist produce his debut CD release State of Art. That record has galvanized Williams as an emerging and prominent voice in the jazz today. 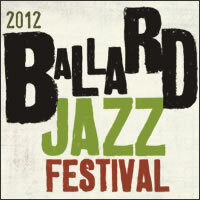 Tickets are now on sale for the 2012 Ballard Jazz Festival which runs April 18-21. Seattle Jazz Scene is proud to once again be a media partner in presenting the festival. Tickets are discounted if you purchase in advance, with the biggest discounts if you buy before April 1st. Click here for more information about the Ballard Jazz Festival. A cornerstone of the Northwest’s jazz and live music scene, the Ballard Jazz Festival celebrates its tenth year with 4-days of events, April 18-21, 2012. Embracing Old Town Ballard’s unique & vibrant community feel, the festival presents a wide mix of modern American music in venues ranging from clubs & bars, to store fronts, shops, and finally, the Nordic Heritage Museum for Saturday evening’s mainstage concert. The festival kicks off Wednesday with 2 nights of themed events at Ballard Avenue’s Conor Byrne Pub – the Brotherhood of the Drum, featuring bands led by internationally acclaimed drummers, and The Guitar Summit, with a creative mix of guitarists which this year includes Bobby Broom, Tim Young, John Stowell and Dave Peterson. Saturday’s events start at 11:00am with a Swedish Pancake Jazz Brunch at the Nordic Heritage Museum along with a classic auto show presented by Washington’s vintage Volvo/Saab Sports Club. Performing will be the Portland/Seattle Group, The Kora Band, offering an exciting & eclectic mix of African music and jazz. The evening’s mainstage concert is hosted by Seattle jazz treasure Jim Wilke and features performances by the dynamic Bobby Broom Trio from Chicago, and the quartet of New York-based pianist Orrin Evans, featuring Chicago saxophonist Geof Bradfield.